The SharePointOrgChart can be configured to allow end users to export the visible organization chart to Excel so as to enable analysis and reporting. With the web part in Edit mode locate and activate Show Export To Excel option in the Export to Excel configuration section. After applying the change the export to Excel icon will be shown menu at the top of the web part. The end user simply clicks the button and the chart will be opened in Excel. By default the Excel export will contain all the data fields available in the data source. 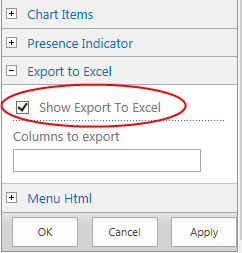 To specify the individual fields to export put the web part in Edit mode and enter a comma separated list ( column name1, column name2, column name3) of column names in to the Columns to export option in the Export to Excel configuration section. A quick way to find the available columns is to turn on the Debug Mode option in the Data Sources configuration section. Once applied a list of all available data columns will be shown beneath the chart.